Have you ever heard of a group ride that advertises a "No Drop Rule in Effect"? Well, roll on down to Gears Bike Shop in Port Credit, Ontario, where Mel Crosby has done just that. In just six short months she's managed to attract 41 members to the brand new club, the Gears Girls Women's Road Group, which now has a freshly designed kit, fall plans for rides and socials, plus ambitious goals for the 2010 season. Objective: "Friendship! I started the club because I wanted to find other women to ride with - I now how 40 other women to ride with!" Moving to the Port Credit area two years ago, Melanie Crosby wanted a way to stay in shape and meet some people. Getting out on the bike was fun, but she found it hard to find other women to ride with. About a year later, in January of 2009, she took matters into her own hands. Mel sent out an inquiry to a local bike shop owner to find out if there was any interest in supporting a club for women riders. 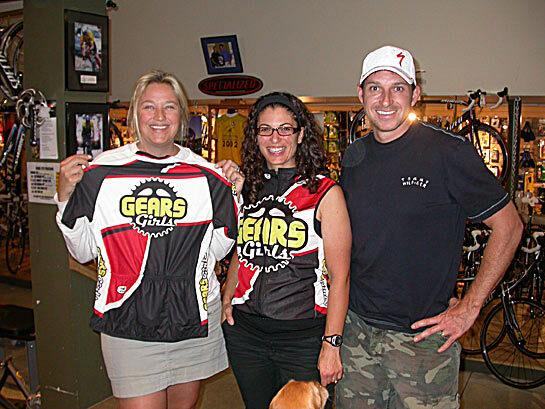 A couple months later, Mel met up with Gears Bike Shop co-owners Ira Kargel and Kevin Wallace. Immediately the owners were on board with the idea and Mel had the green light. The trio started spreading the word and the club had its first meet-and-greet mid-May, followed by their first group ride a few weeks later. Things have taken off quickly since then and the club has grown to a membership of over 41 riders in just six short months. They meet up for rides three times a week and average about 8-10 riders per ride. On August 26 and 27, Mel presented the club members with their new kits designed by local riders Lucinda Wallace and Anne Guzman. Organizing a club is not easy, but Mel seems to be perfect for the job . "The amount of administrative work involved - I really didn't expect it!" says Mel. "Creating and tracking membership forms and waivers, creating and updating the Gears Girls blog ( gearsgirls.blogspot.com/ ), organizing kits, organizing clinics, answering email from potential and club members, organizing ride leaders, planning routes, etc. It's gotten easier as the summer has progressed but there's still ongoing work - I send out weekly updates about the club and three weekly rides, I respond to members' emails and potential new members' inquiries. Sometimes running the club seems like a full time job!!!" The no-drop rule is in effect, no joking around. "We never leave anyone behind," Mel explains. "We generally ride with a leader and a sweep - quite often the sweep will stick with the slower riders and the lead will stick with the faster riders. We regroup and allow slower riders to catch their breath - we haven't lost anyone yet!" 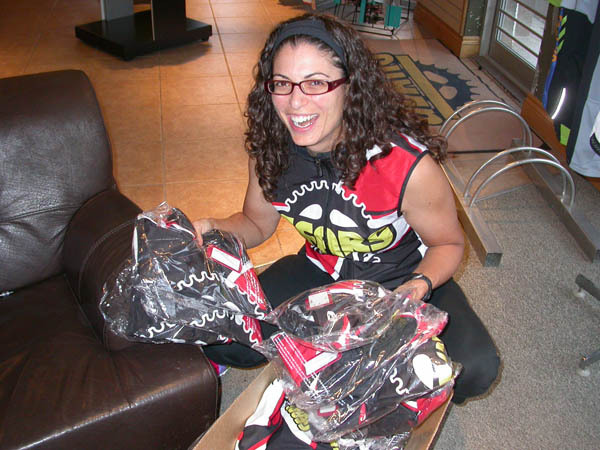 The format of the club has attracted a lot of new riders to the sport, Gears Bike Shop co-owner Ira Kargel explains. "When we began Gears Girls the most common response from the ladies we talked to was; "Oh I don't know - I'm not very fast". There was this recurring idea that to ride a road bike in a group you had to be FAST," co-owner Ira explains. "Gears Girls has shortened the traditional 80km+ distance, and maintained a more comfortable speed, where the riders are still 'Roadies' and not just a recreational touring group ... Gears Girls is a network of women sharing, learning, and experiencing the joys of riding road bikes, together." The mandate appeals to a lot of beginners, or riders getting back into the sport that want to ride but are intimidated by the faster groups. "Rarely do you see a lot of women out riding in a group, let alone a women's only road riding club. One of the biggest reasons fo r this is the intimidation factor," Ira comments. "Many road groups out there today are spurred on by testosterone and one-up-MAN-ship; it can be scary and not fun to participate in this kind of setting. Gears Girls provides a club format that is less intimidating, but still authentic. The ladies are able to participate in Learn To Ride, Learn To Race, Fix My Bike Clinics, etc, that further enhances the feeling of success and confidence." The club does encourage growth, learning, confidence building skills and the pure enjoyment of getting out and riding, for its members. Mel loves the fact that the club allows women to become more confident, strong and skilled riders. "And more importantly, they're out riding! Women that used to only ride once every couple of weeks are now out riding a couple times a week - I love that they look forward to the next ride!" Having one speed for group rides has been challenging for Mel. "Adapting the rides so that all experience levels can participate and enjoy themselves has been tough. There have been some routes I would like to offer to the group but thought maybe some of the newer riders might find them too challenging - other routes are not challenging enough for more experienced riders." As a result, Mel is considering offering two options for group rides for 2010, one for beginners and one for intermediate riders. "This year there has been a high ratio of new riders and for 2010 I'd like to attract more seasoned riders that can potentially act as group leaders on the rides." Mel also wants to provide more resources for the club. "I'd like to see about getting sponsorship (in addition to Gears) for the group; add a website (we only have a blog); grow in (club member) numbers; and offer more clinics." 1. Definitely affiliate y ourself with a good bike shop! 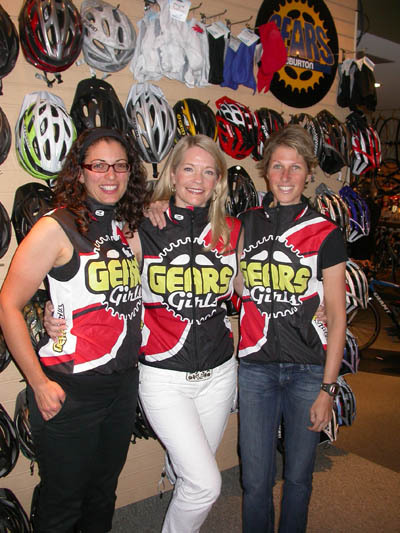 Gears Girls wouldn't have seen such quick success without the assistance and support of Gears Bike Shop in Port Credit. 2. Don't presume that all women are familiar with the nuances of group riding. Be prepared for a high ratio of very new riders looking to learn basic bike handling skills - from things like using clipless pedals, to gear shifting, to drinking and eating while riding, to riding in a paceline. But also be prepared for the fact that women want to learn!!! 3. Find committed, reliable, experienced ride leaders to help out with the club. Having a ride leader and a sweep on every ride is definitely a bonus. 4. Stress safety but also fun. You want to challenge the members, but you also want them to ride regularly. Make sure the rides are appropriate and appealing to all members - and if possible - offer multiple levels of rides in order that all riders from total newbie to experienced rider enjoy themselves. 5. Tell everyone you know about your club - whether or not they ride or not! Word of mouth is probably the best way to attract new members. Check the Gears Girls blog ( gearsgirls.blogspot.com/ ) for upcoming fall events that include a nice social outing, a 2-day riding tour in the Niagara region in October and the rest of the fall riding schedule. Do you want to tell us about your women's cycling club, team or event? Just email Leigh Hargrove at Leigh@canadiancyclist.com and tell us all about it ... We may just feature it here in the women's section of CanadianCyclist.com! Please include your name, phone number and e-mail address for us to contact you.